Now in a brand new, revised and updated edition, this is probably the most thorough "How-To-Do-It" book on coyote hunting ever written because in it author Phil Simonski tells you not only how to outsmart the wily critter in the field, but how to care for its precious pelt once you've taken it. Chapters include Hunting the Coyote; A Little About the Critter; Rifles, Shotguns and All That Other Stuff; Planning the Trip; Locating Mr. 'Yote; Calls and Howlers, Where to Look and Not to Waste Your Time; Now that You've Got Him, What Next; and a special closing chapter on possible surprises the coyote hunter might encounter. More than 80 excellent photographs illustrate the book. 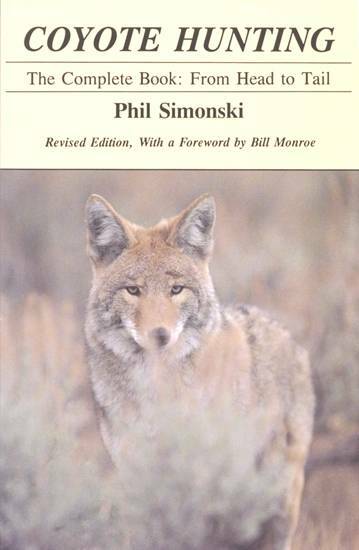 Phil Simonski is the ideal person to put together a complete guide on hunting coyotes and caring for their pelts. He has put many years into acquiring, firsthand, the kind of knowledge that sets him apart as an expert on the coyote. From his earliest days growing up in the eastern part of the country on to his becoming a professional forester and moving to the West, he's been an avid hunter of big game, small game, and predators. Coyote Hunting contains 130 pages, issued in 5½ by 8½ inch format, with a new Foreword by Bill Monroe. Softcover only.